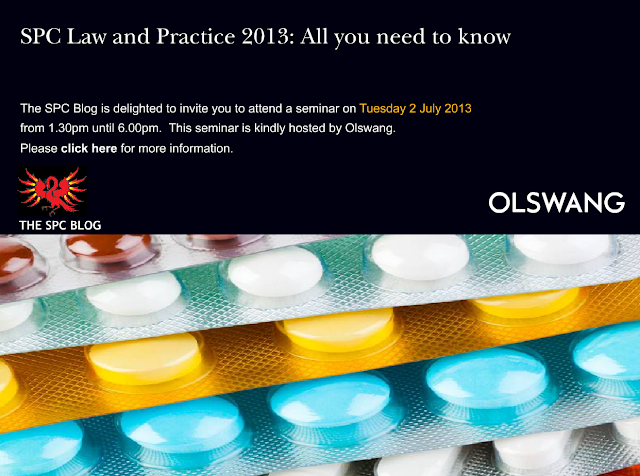 The SPC Blog is delighted to announce the launch of "SPC Law and Practice 2013: All you need to know" -- the title of this year's seminar. The date is Tuesday, 2 July 2013, when prospects of snow interfering with participants' travel arrangements are low, and once again we are pleased to acknowledge the kind hospitality of Olswang LLP in agreeing to host this event at its London office. This year's seminar, the fifth, is built around the responses of blog readers to our earlier request for suggestions. It will be taking a focused look at how national patent offices are implementing the Court of Justice (CJEU) rulings in Neurim and Medeva, the pharmaceutical regulatory process and its interface with SPC law. We'll also review and analyse the pending CJEU referrals and discuss a range of hot topics including the Unified Patent Court (UPC), SPC economics and so-called piggyback SPCs. There will be plenty of time for questions and a drink afterwards. We do hope that you will join us for the usual series of topical presentations and the best Q+A on SPCs anywhere!